Our objective in terms of celebrating our 25th anniversary is to ensure that we make our mission for a better and healthier world truly visible. In this connection, we have taken the UN Sustainable Development Goals – in particular those of “Good health and well-being” - as the basis for our actions. During the course of 2019, we will be announcing five different categories for our actions. For each category we will call together a team that will have just one year to innovate a grand total of 25 different actions that will make our mission real. Our continuous investment in R&D combined with our close collaboration with the scientific community have helped us to progress rapidly as a company. Our highly experienced and professional colleagues regularly publish articles and also speak and put together posters at international conferences. Our researchers consistently collaborate with the world’s leading researchers of the cardiovascular diseases. Furthermore, as a company, we are committed to giving back to science by supporting students through both sponsorships and scholarships. See a list of our articles. In May 2019, we will be sponsoring a young scientist via our EFLM-HyTest Cardiac Marker Award. Meanwhile, in 2020 we will be giving out the IFCC award. We also want to increase the awareness of different biomarkers by producing compelling online material and delivering interesting lectures at various events. We also support student unions in a number of different ways. Call for nominations: the closing date for the receipt of nominations was 17 February 2019. See more information about the EFLM-HyTest Cardiac Marker Award. Meanwhile for more information regarding the IFCC Award, please visit here. We are renowned and recognized for providing several products in the area of non-communicable diseases such as heart diseases, diabetes and chronic kidney diseases. Our aim is to continue to develop new products in order to help diagnostics of the non-communicable diseases. We manufacture monoclonal antibodies and antigens that are mainly used as key components of diagnostic tests. And the core of our business is guaranteeing both consistency and the high quality of the products we offer to our customers. We are a proud market leader in cardiac markers and influenza testing reagents. We have set ourselves the goal of reducing our waste during the year and to focus on recycling and renewing the packaging materials that we use. Examples of some of the actions we aim to undertake include reducing the amount of plastic material in our shipment process and moving to e-invoices rather than paper invoices. We have a lot to offer the world and we intend to share some of it with our neighboring communities in Turku, Shanghai and Moscow. We are fully aware that we have been truly fortunate to have prospered in our endeavors and so we feel it is our duty to give back to the communities where we have presence as a business. 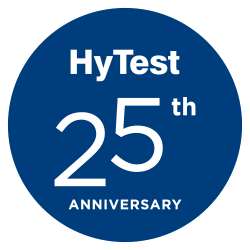 HyTest and all of those who work at our offices in Turku, Shanghai and Moscow, are already very active in terms of supporting their local communities. To this end, in 2019 we will be sharing with you the activities and initiatives developed by each of our offices. Team member will be announced soon. Want to stay updated about actions?